LINNEA DAYTON, who has authored nine previous editions of the award-winning Photoshop Wow! Book, has written and edited numerous other books and articles about computer-based artmaking and is series editor of Peachpit Press’s Wow! books. 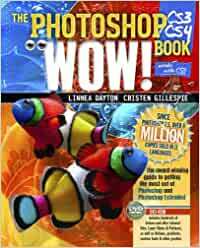 CRISTEN GILLESPIE authors her second edition of Photoshop Wow! She has contributed to other books in the Wow! series as well as the “Wow! Factor” column for Photoshop User magazine. All around awesome book. When I had CS2, I bought that edition years ago. Back then as a photoshop beginner, it was hard to follow because there is so much presented. As I gained proficiency, I referred to the CS2 version more and more. When I upgraded to CS3 in Jul 2015 from eBay, I eventually bought the CS3/CS4 edition. Now with both editions (because the examples given differ) I have a massive library of How-to examples to pull from. The book ranges from basic stuff like how to navigate the work screen and make selections etc. to some very sophisticated techniques.Almost everything you will ever do in photoshop is covered to some degree. If you are good at photoshop, you will only get better. I'm still using PS CS4 & CS5.5 as I haven't really found a need to update to something newer (and I don't have the bandwidth to do the online subscription service that's required with newer licenses). I've been buying these WOW books since the one for PS5 came out and I attended a teacher workshop on it). The WOW book series for both Photoshop and Illustrator is a great resource for getting up to speed and learning new techniques (least for me). I can't praise these books enough. I wanted to be able to see what the difference was between tools, Filters, and Image Adjustments. This book really helped me progress from Brightness/Contrast to Levels. I began to use Actions more. I settled on using Unsharp Mask over the other choices for sharpening. At times I would just flip through the pages to see how photos were tweaked. Where the book really helped was in showing the results of different settings. I could look at the photos and know which result I wanted and then read the step by step instructions. Sometimes I would think that the photo was good enough and then I would see how an area was improved. So I would learn new tricks. The menu items were simply explained and when to use them. After a year and a half I am still consulting it as I learn CS 6. 5.0 out of 5 starsNeed a good reference? I am still using CS3 so finding reference books for the software can be difficult. I had checked this book out of my local library three times before I decided to buy a copy. The used copy I purchased was actually in better condition than the library copy; and it had the DVD unopened in the back of the book. I couldn't be happier with my purchase. This is a really helpful book, even though it is older, it still teaches you basic techniques and fundamentals, I had this as a class book in one of my college classes, and wish I would have never lost it, glad to have it back!